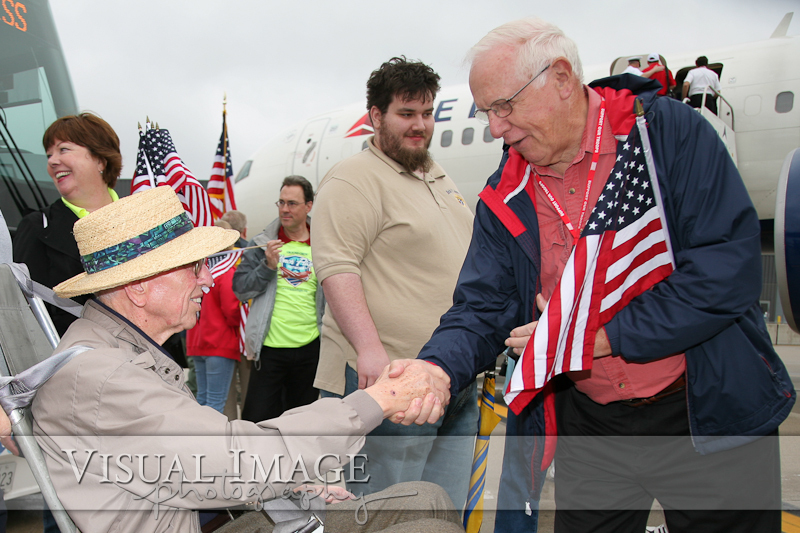 The Stars and Stripes Honor Flight departed Milwaukee's General Mitchell airport on Saturday, May 14 with 100 World War II veterans. 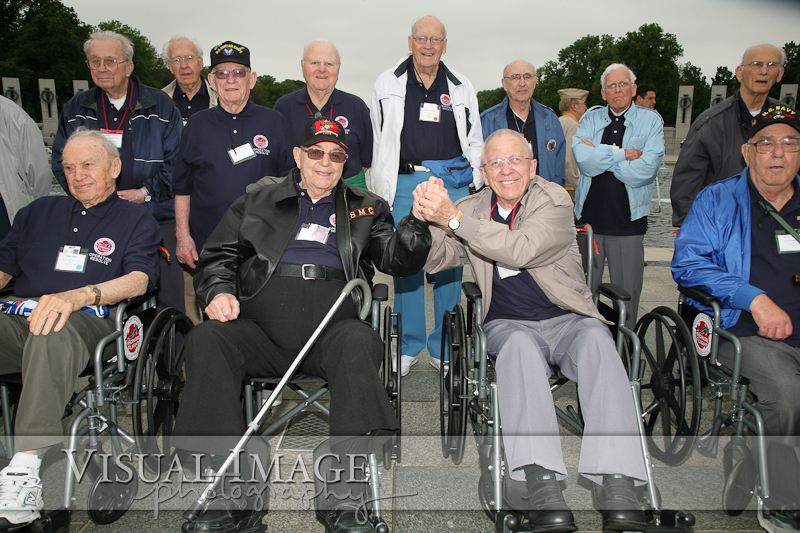 Once again, Courtney Lutz traveled with these heroes to document their trip to Washington, DC. 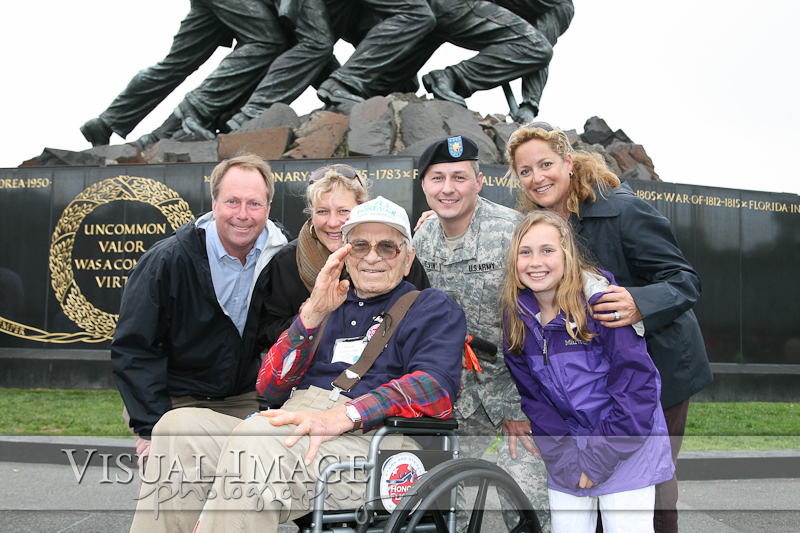 The Stars and Stripes is an amazing non-profit organization that is committed to bringing WWII veterans to Washington, DC at no cost to them so they can see the monument that was built in their honor. 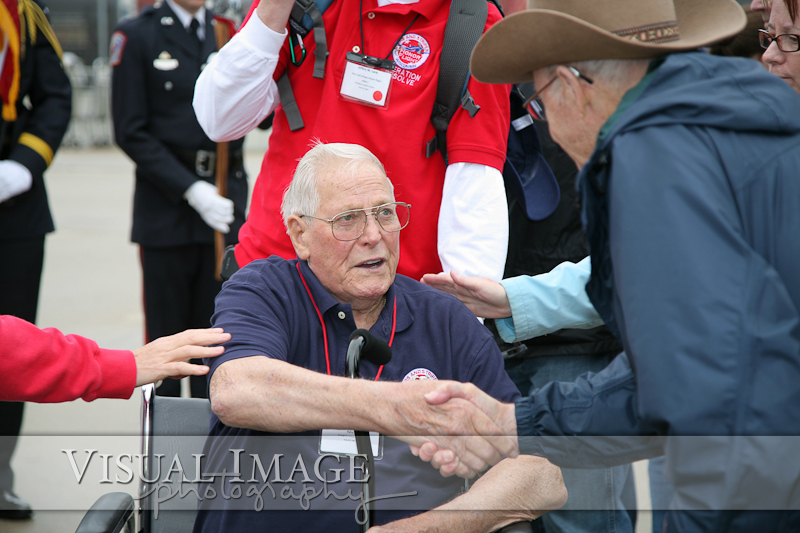 Learn more about the Stars and Stripes Honor Flight by visiting their website, follow them on Twitter, or connect with them on Facebook. 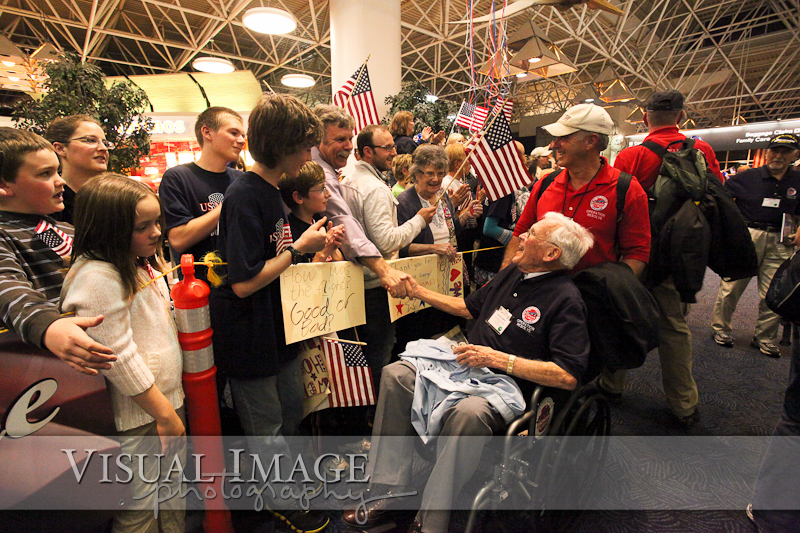 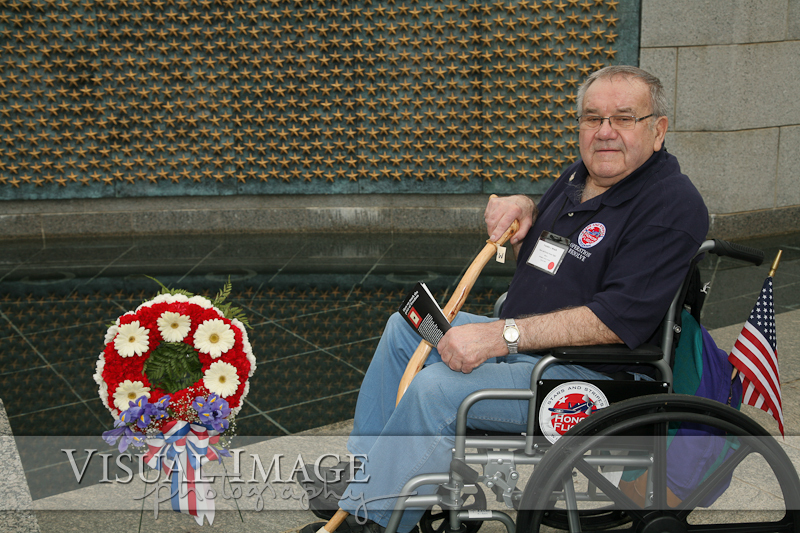 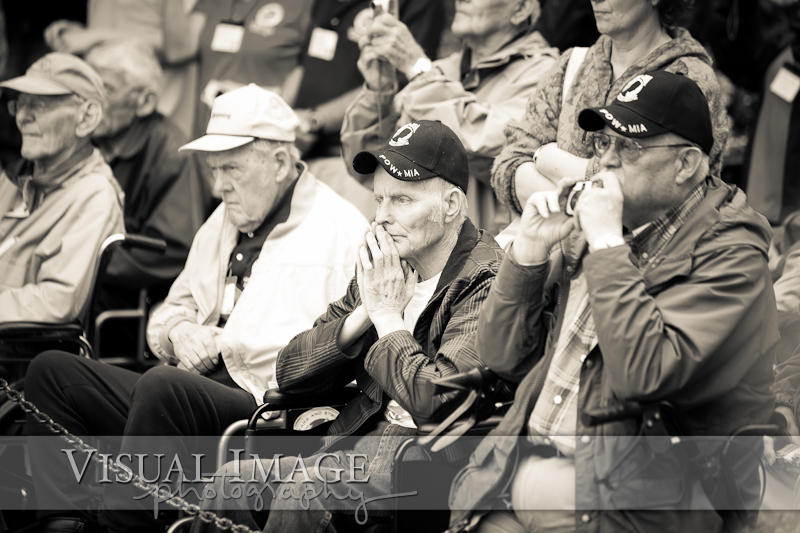 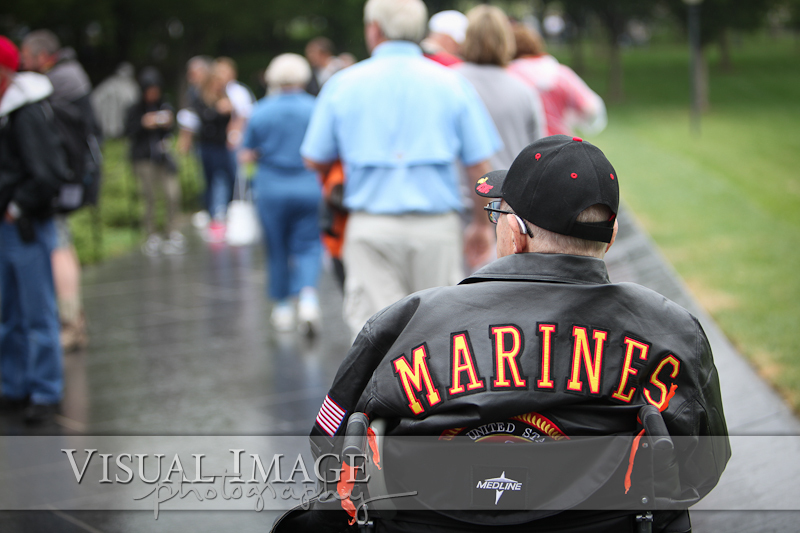 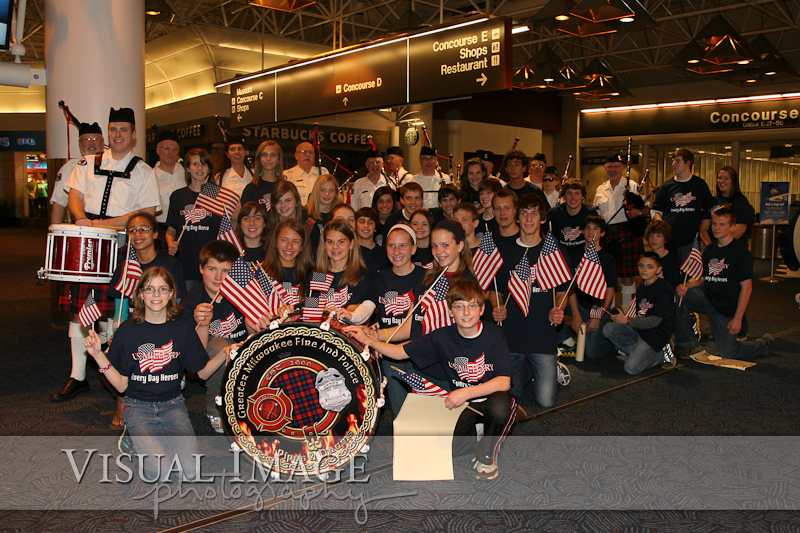 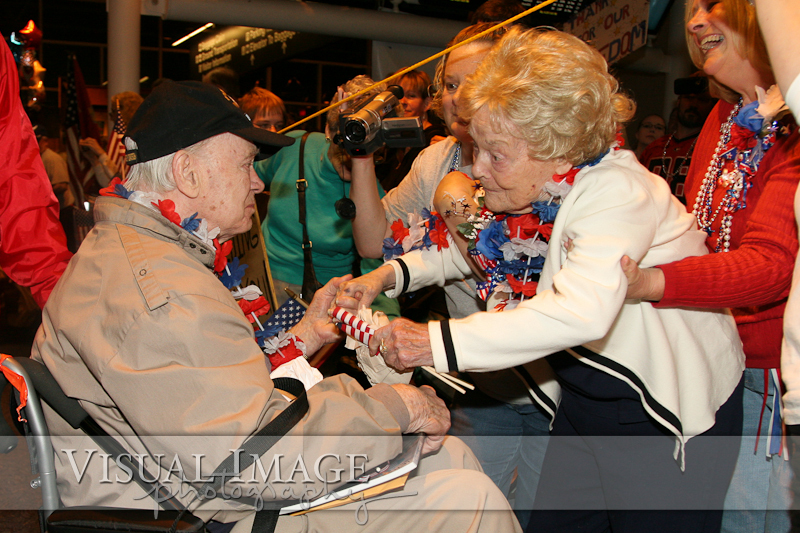 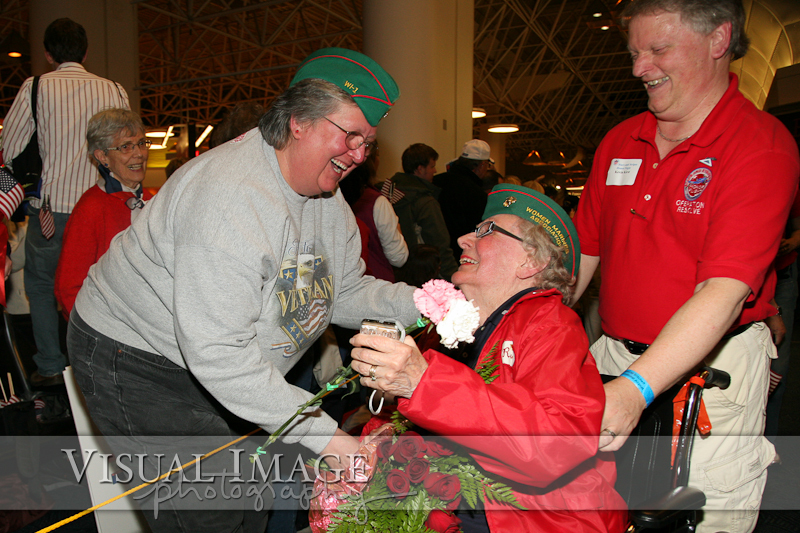 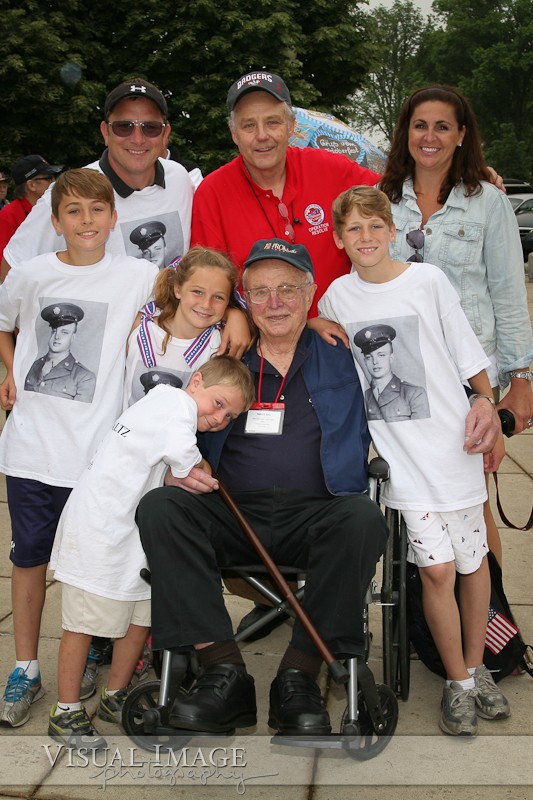 You can view and download images from four different Honor Flights by clicking here. 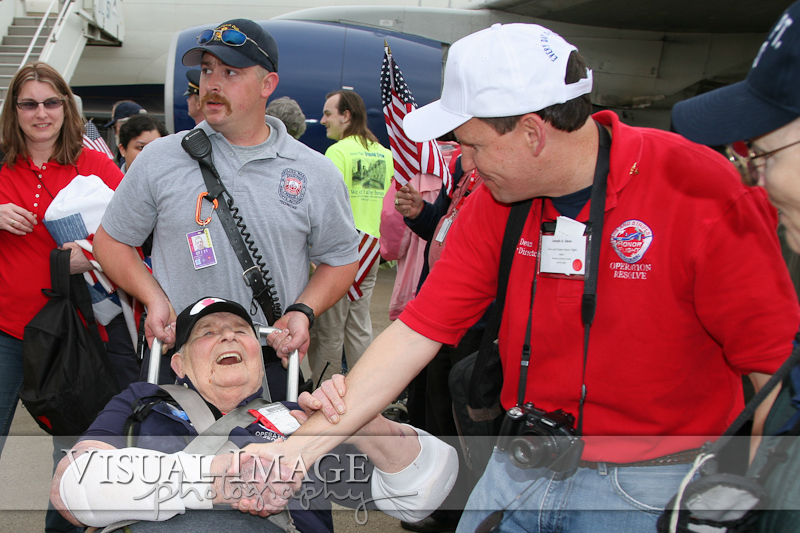 Before you scroll through some of our favorite images from the May trip, be sure to watch this outstanding documentary trailer created by Freethink Media about the Stars and Stripes Honor Flight. 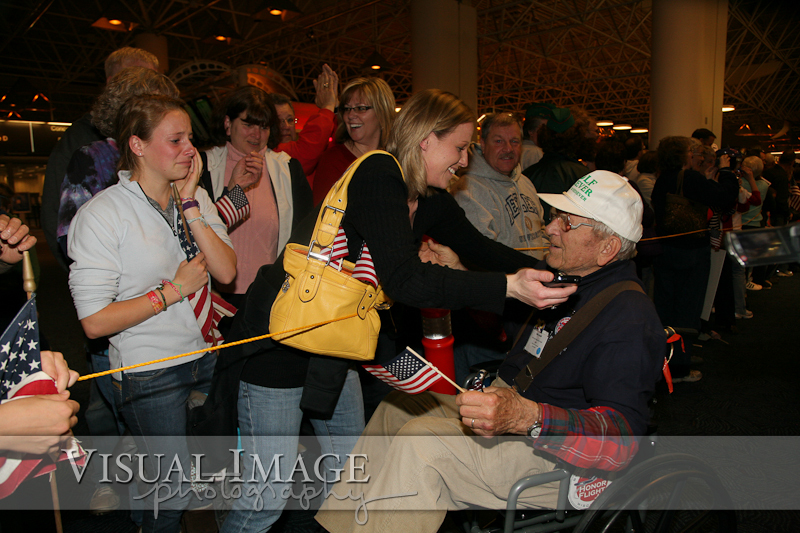 I know one of my other posts also has this video, but it is so emotionally moving, it's worth watching again. 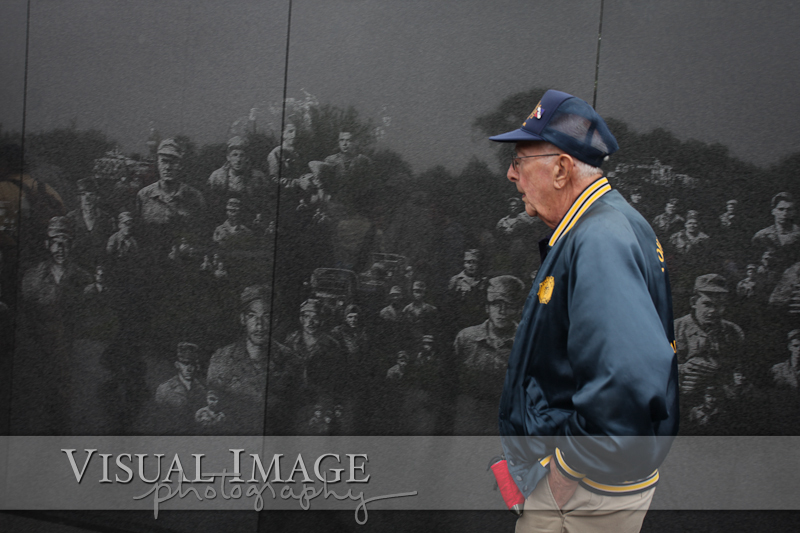 Of all the images Courtney captured during the May trip, these are some of her favorites. 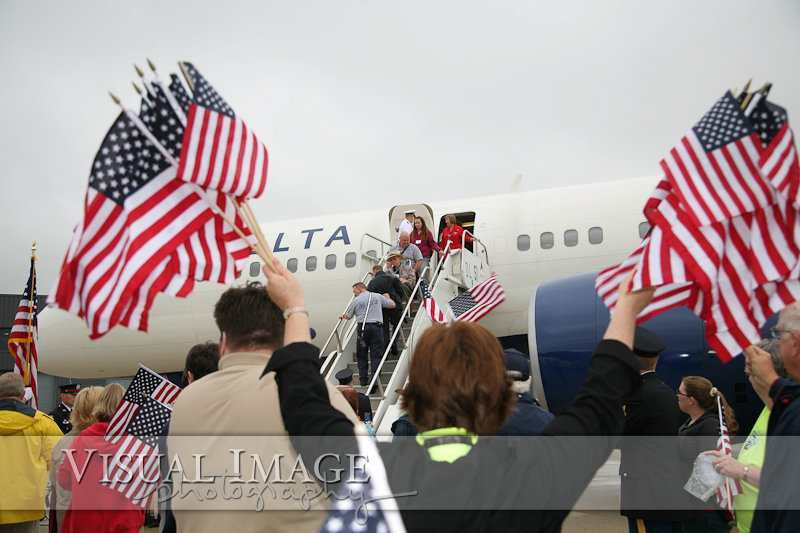 The veterans aboard the flight receive a water canon salute as the plane departs General Mitchell International Airport. 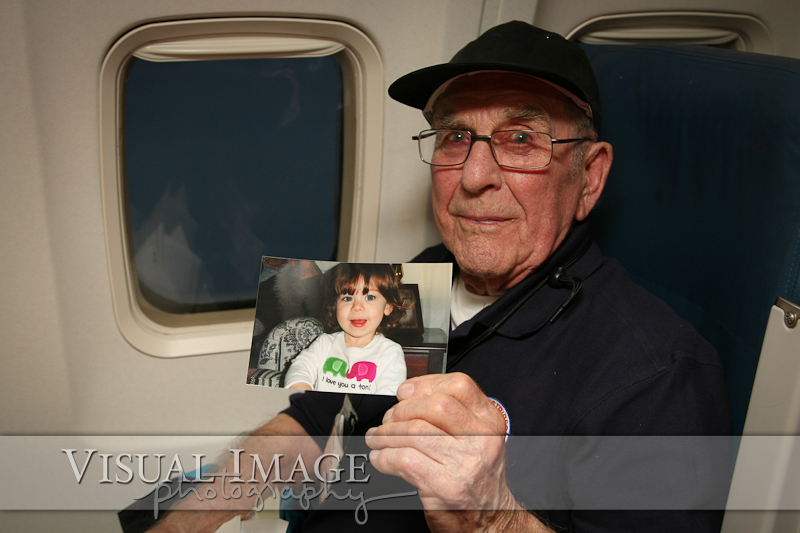 One of the Delta flight attendants brought along a photo of her father, because she knows he would have loved to have been a part of this experience. 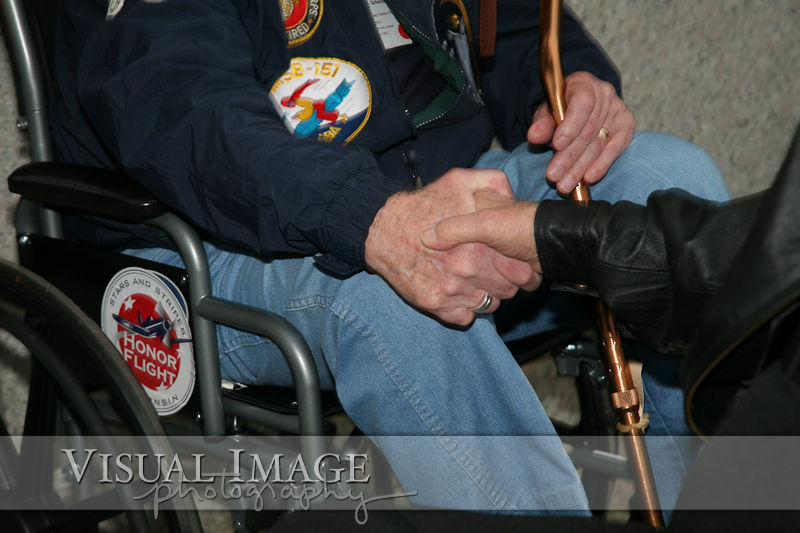 Over 900 World War II veterans die every day, which is why "Every Day is a Bonus" is the motto of the Honor Flight. 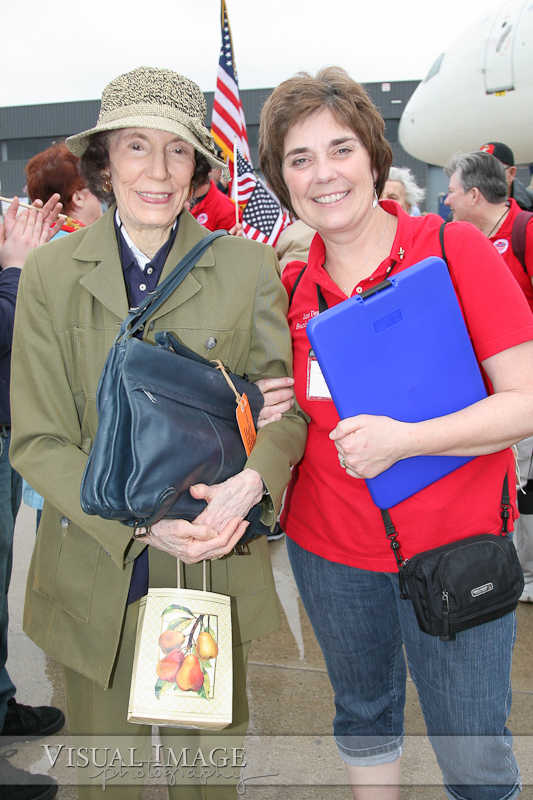 Stars and Stripes board of directors Jane Dean spent the day escorting Lucy Cohn. 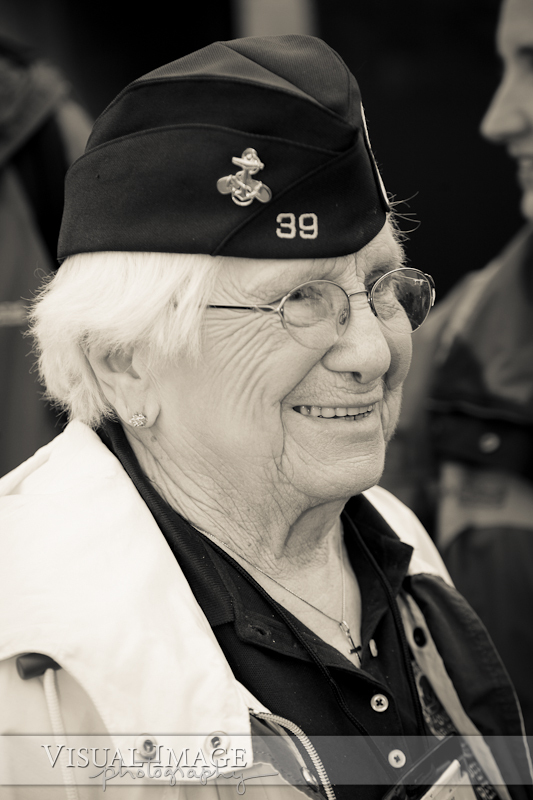 You can read more of Lucy's story here. 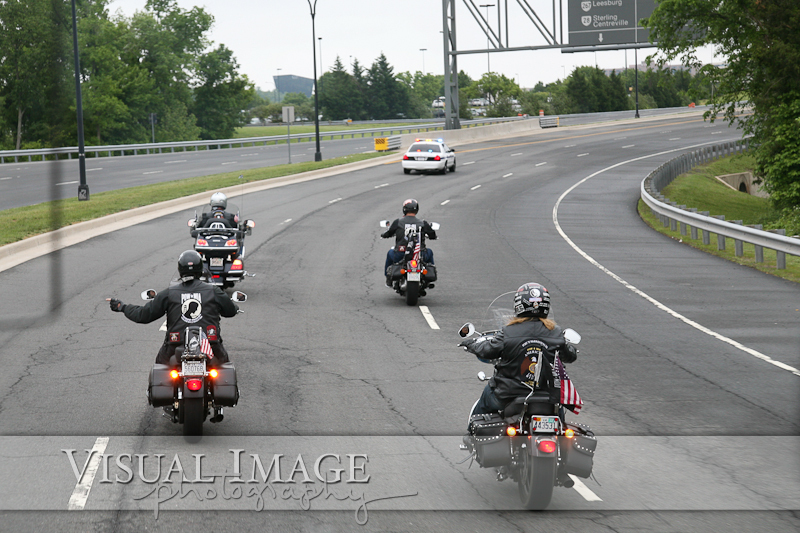 The veterans who made the trip are escorted into the city by the police and a group of Freedom Riders. 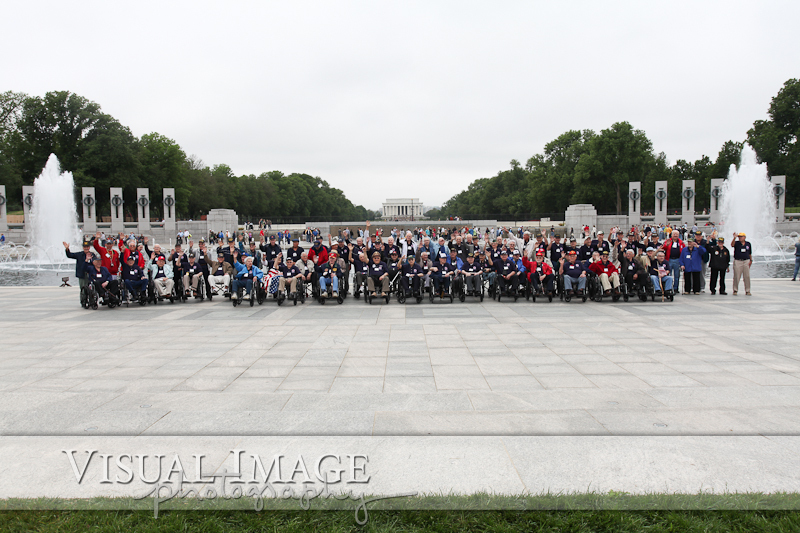 The veterans of the May 2011 Honor Flight in front of the World War II Memorial. 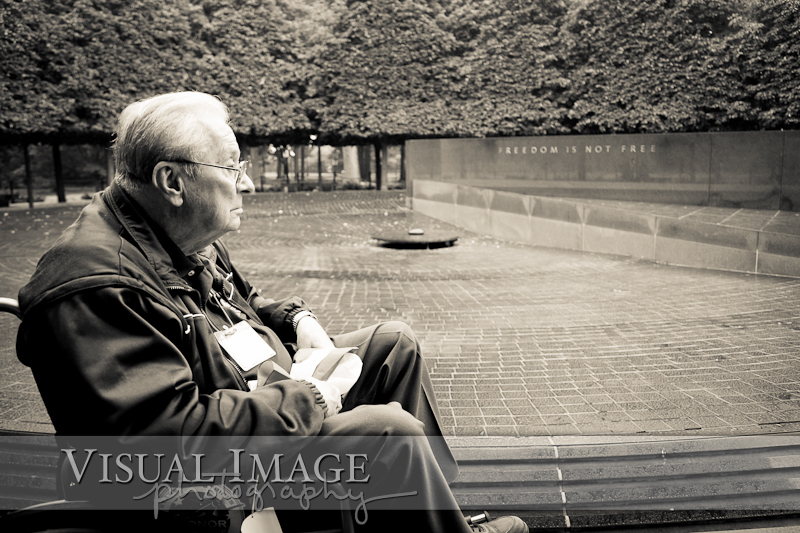 Joe Dean, the current president of the Stars and Stripes Honor Flight, leads everyone in a moment of silence at the World War II Memorial. 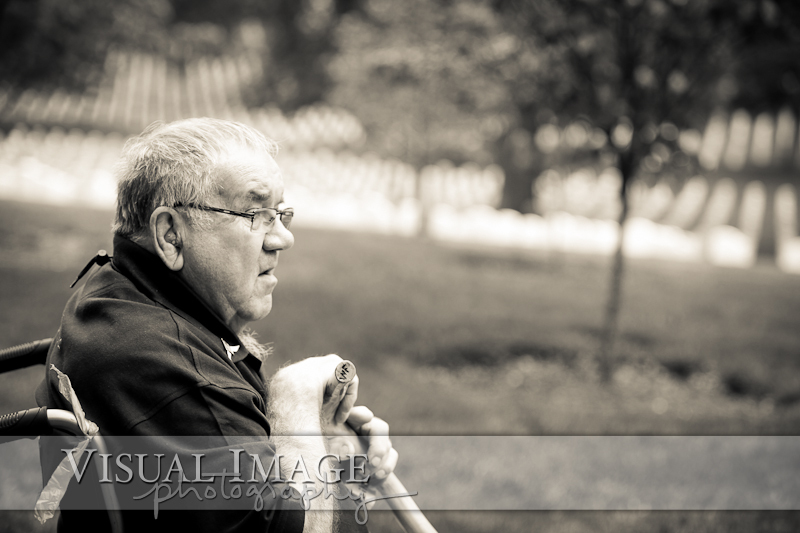 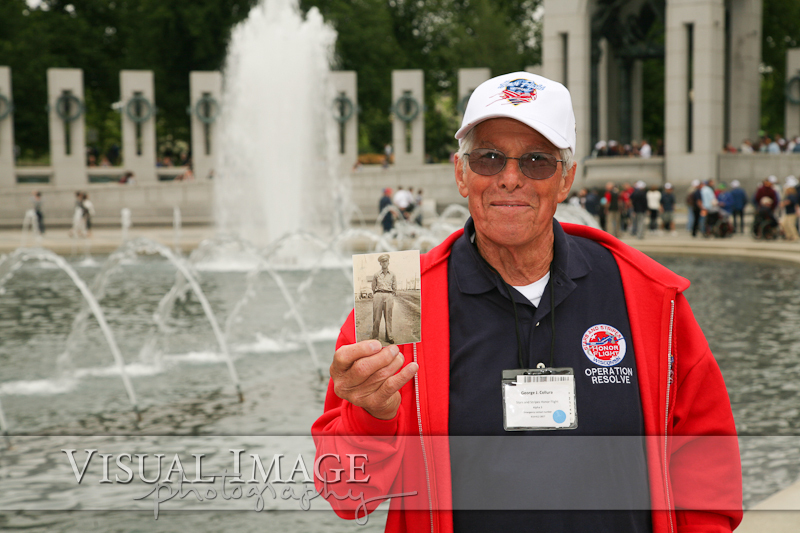 George Collura was asked by a friend from church to bring a photo along with him on this trip. 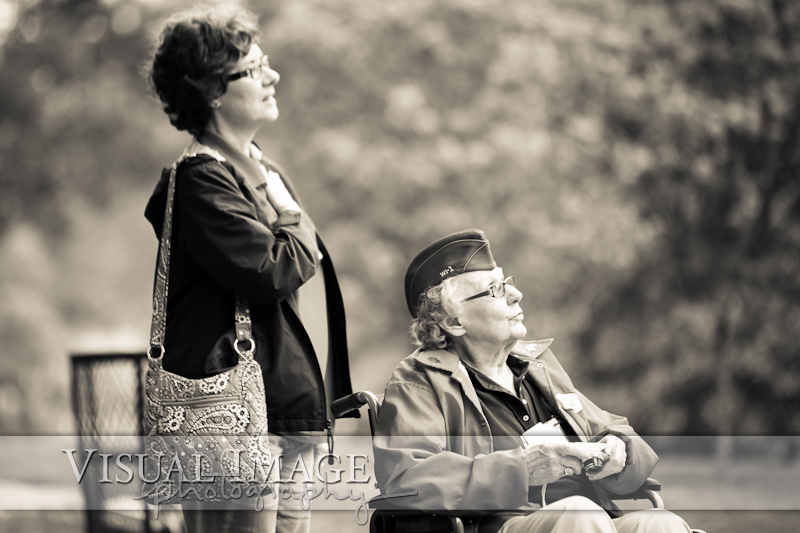 Her father was killed in Italy in 1944. 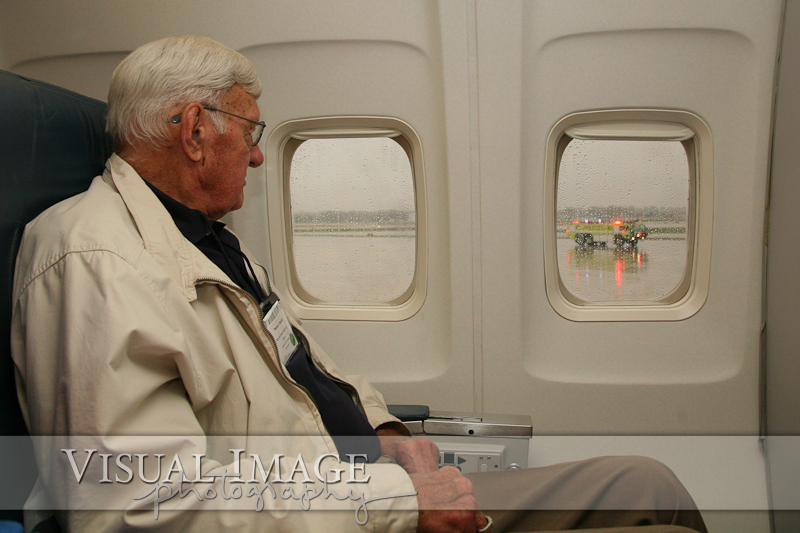 Click here to listen to the story of this photo, which was recorded by Jodi Becker from 620WTMJ. 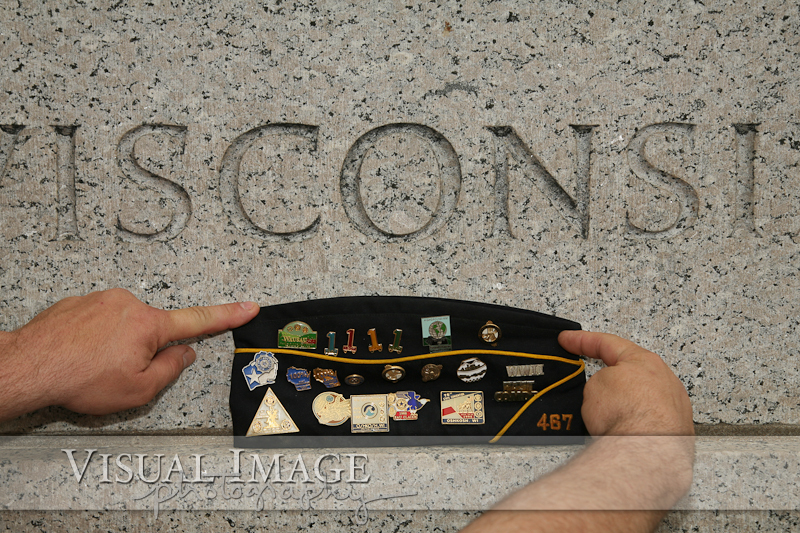 There are over 4,000 stars at the World War II Memorial. 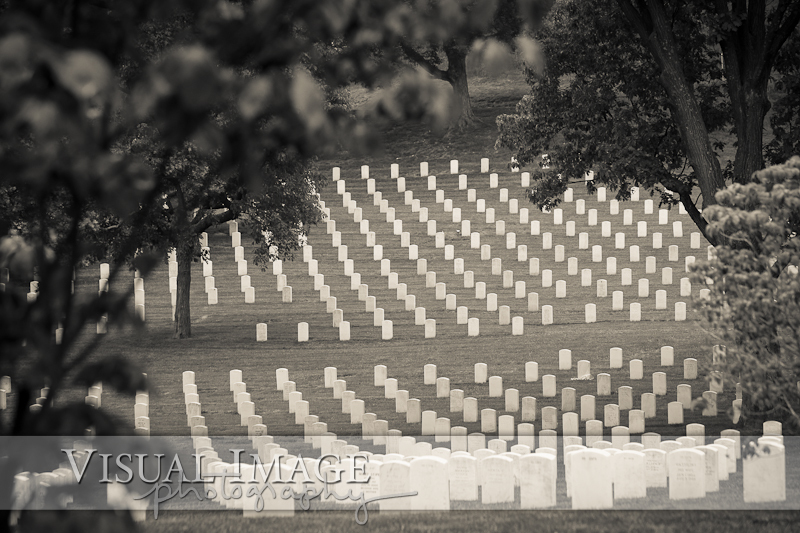 Each star represents 100 American military deaths, which means that over 400,000 American military personnel gave their lives defending our freedom. 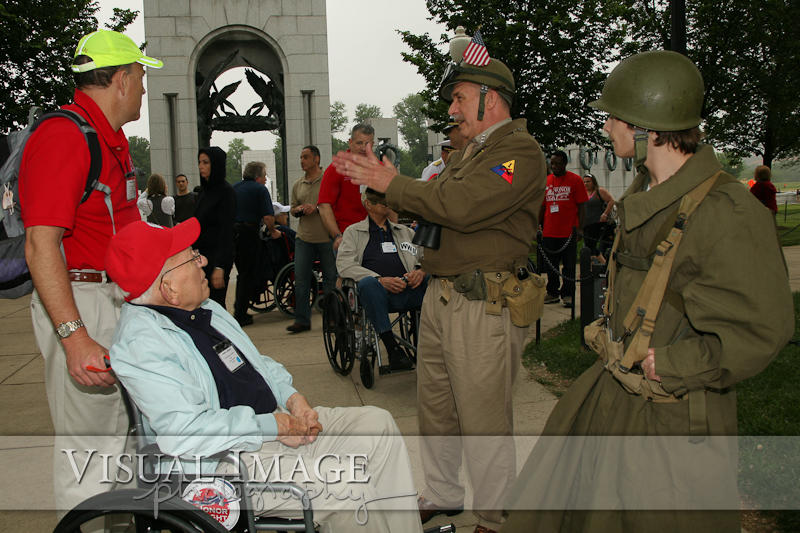 World War II veteran Dalton E. Baltz, of Fond du Lac, is greeted by four generations of his family at the World War II Memorial. 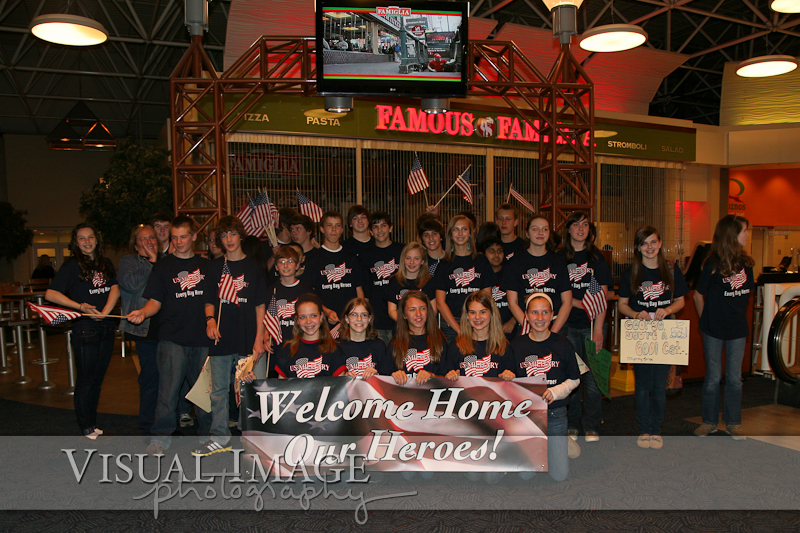 They all had t-shirts with his picture printed on it as part of the surprise. 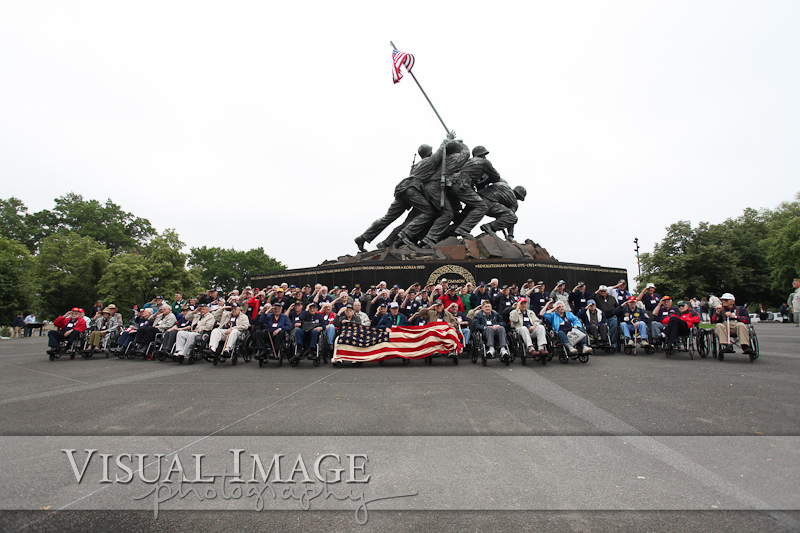 A group photo of the veterans from the May flight in front of the Iwo Jima memorial. 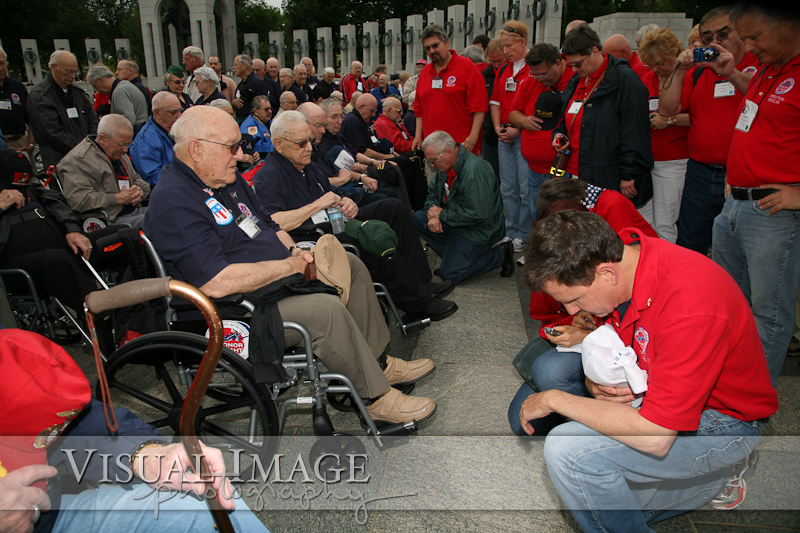 Besides visiting the World War II Memorial and the Iwo Jim Memorial, the Honor Flight also visit Arlington National Cemetery and the Tomb of the Unknown Soldier. 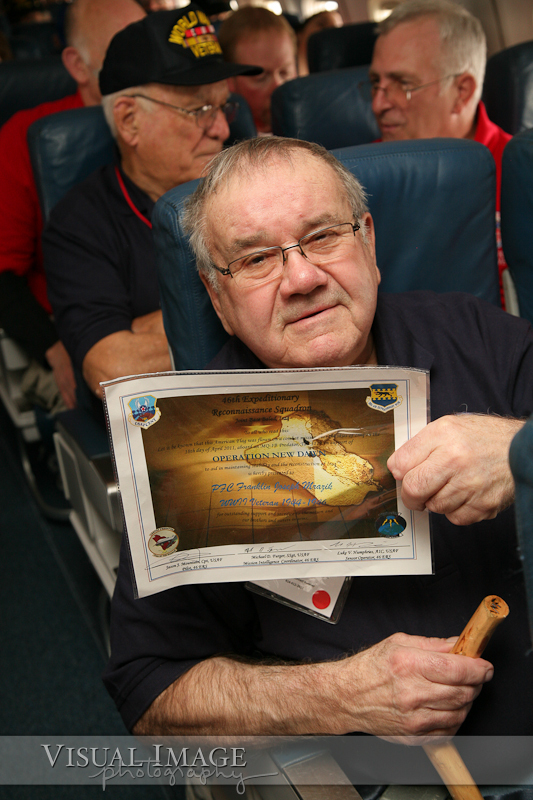 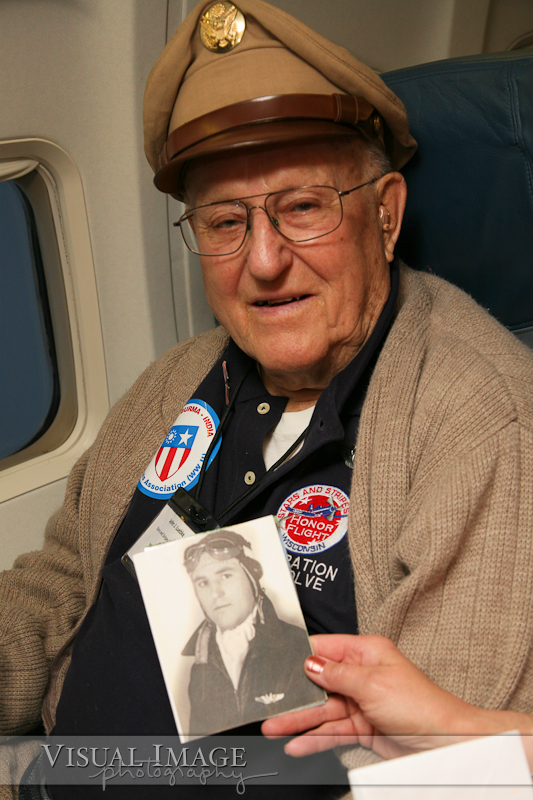 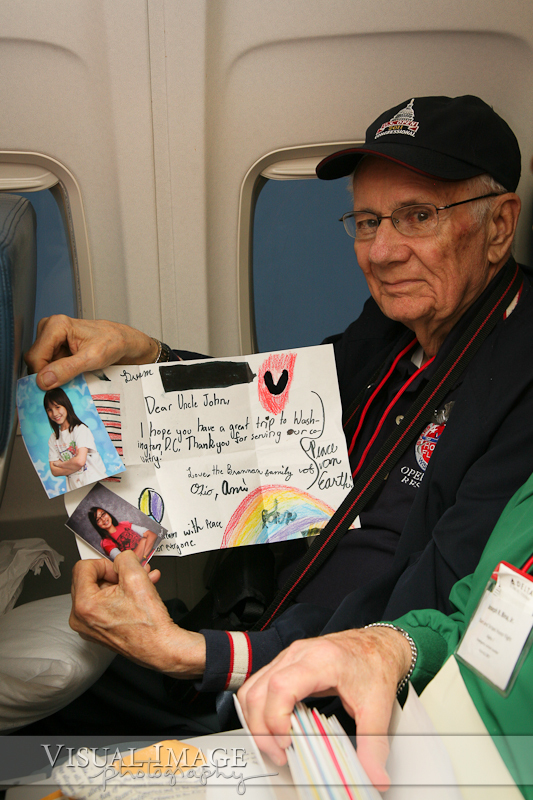 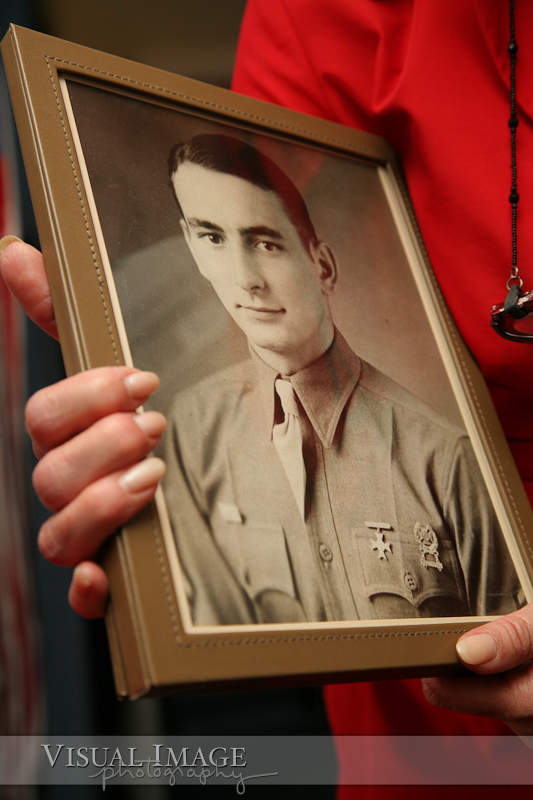 On the flight home, there is a mail call for the veterans, where they receive letters from family members. 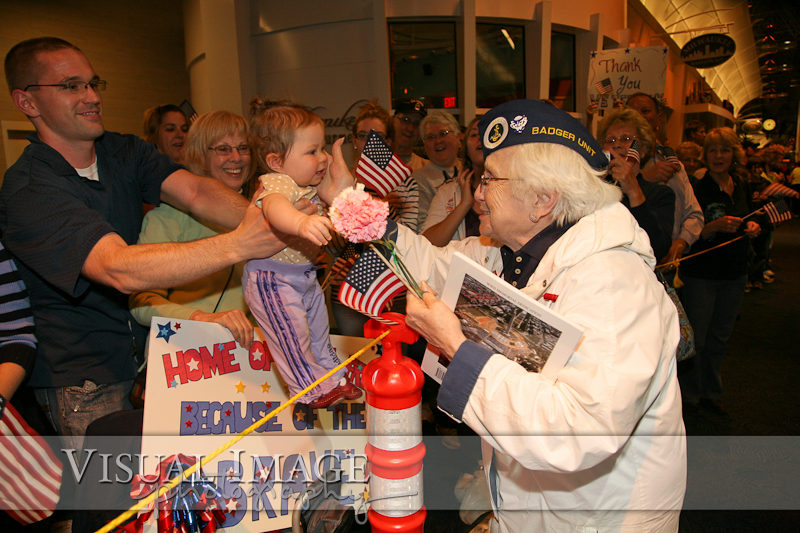 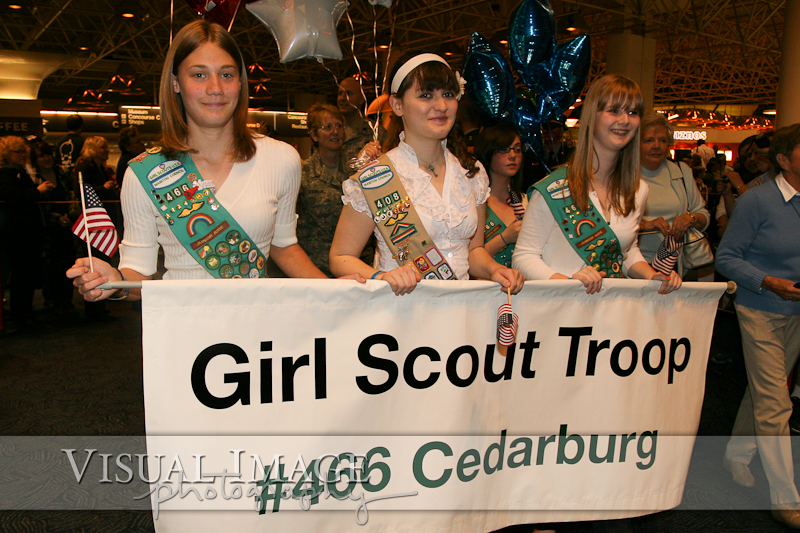 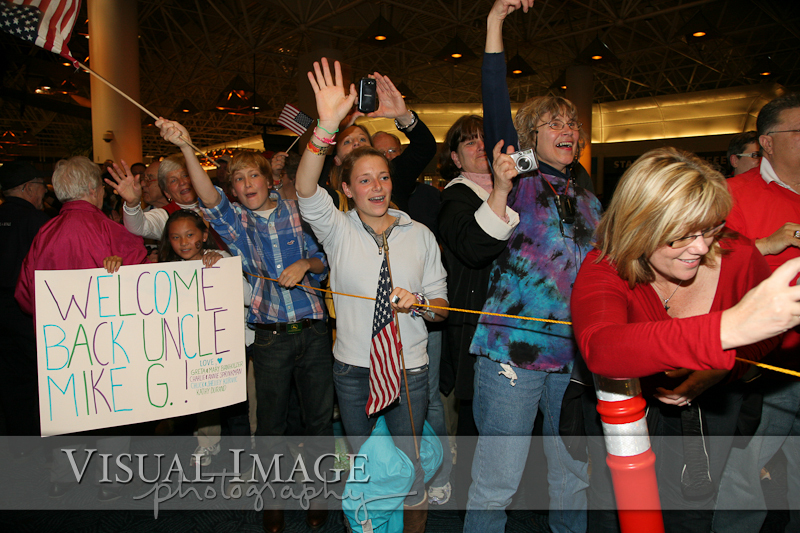 The celebration when these heroes return to the airport in Milwaukee is an amazing celebration. 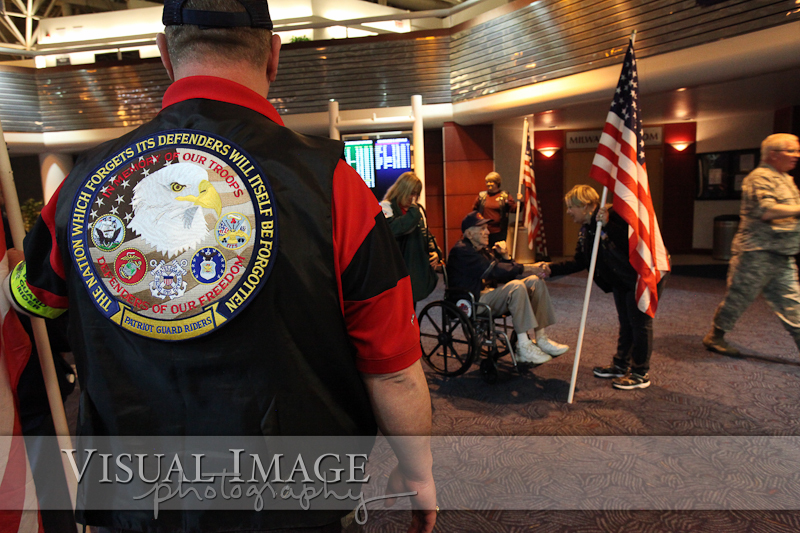 Hundreds of people were there to greet the veterans as they entered the concourse and cheer for our veterans.